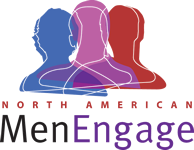 The North American MenEngage Network (NAMEN) is pleased to sponsor a Community of Practice. A forum for members of NAMEN to share their work and benefit from mutual engagement and feedback. LOCAL WORK - FIRST EDITION. The heart beat of social change and justice is in the local work. What we do in our families, our neighborhoods, schools, cities and towns, brings purpose to life. Today we hear from two local projects, and consider their current and critical questions. What is the purpose, goal and objective? How do you know there is progress? What are the benefits along the way? What are our current and most critical questions? The part that I showed you all was from part 2 of the 5 part series. Please do watch the entire series to get the whole story.